When a project is built, it can be tempting to define the process as beginning with the groundbreaking and ending with the completion of construction. In fact, for most Derrick Building Solutions clients the project itself is a single chapter of their growth story. Croix Gear of Hudson, Wisconsin, is a perfect example of this. Ruthie Johnston and Matt Johnston of Hudson’s Croix Gear spoke with our staff recently to share the story of their growth and expansion which included partnering with Derrick Building Solutions. 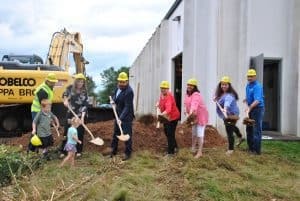 In 2016, Croix Gear celebrated a groundbreaking on a construction project at their Hudson, Wisconsin, headquarters to add 23,000 sq. ft. to their existing facility. While this event signaled an exciting start to a project it also celebrated the culmination of at least five years of analysis and planning for increased efficiency, maximization of effectiveness, and smart planning for the next generation of company growth. Beginning the expansion project in 2016 was also meaningful because it marked the company’s 50th Anniversary. Back in 1966 the company was founded as Marine Associates, a manufacturer of custom marine drive systems for fresh water and saltwater boats. The founders, Tom & Vivian Johnston, were Hudson, Wisconsin natives who combined their love of the St. Croix River and boating with precision machining skill to start a company. As the company grew it also diversified by increasing its precision gear manufacturing for a broader cross section of industries beginning in the late 1980s. In 2011, the company changed its name to Croix Gear to more accurately reflect the products manufactured and the variety of industries served by the company. During this same timeframe in 2011, the company determined that it was out of room at its current location and growth trends had them doubling in size during the next several years. Rather than forge ahead by adding more of the same, Ruthie Johnston and Matt Johnston decided to take a methodical approach in planning to make the company more effective and more efficient in all processes. They worked with the Manufacturing Outreach Center at UW-Stout to look at their production flow and incorporate lean principles to maximize the efficiency of all aspects of their operations. Now-retired project development director for Derrick Building Solutions, Mark Mitchell, worked closely with the team during the planning process to ensure that the new expansion would be designed to meet the needs of the reorganized and streamlined operations. The plans were then created for a 23,000 sq. ft. expansion to their existing 40,000 sq. ft. facility. Croix Gear worked with Derrick Building Solutions as the Design-Build General Contractor and selected a pre-engineered steel building system from Butler for the expansion. The project included 3,800 sq. 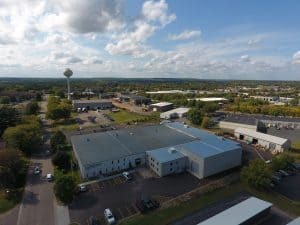 ft. of two-story office area with an elevator and lift, as well as two new loading docks, a new drive-through crane bay, space for a finishing area, and a more effective shipping and receiving area and inventory storage. The facility itself features an MR-24 standing seam roof and texture wall insulated panels for construction. The project broke ground August 19, 2016 and was completed December 2017. Derrick Building Solutions entered the Croix Gear expansion for the Associated Builders & Contractors Projects of Distinction Awards for 2017 and earned a Silver Award at the February 2018 ceremony. Once the expansion was completed, a careful move ensued which incorporated the carefully planned plant and process layout the company had developed. The move of some operations into the new space provided the opportunity to fully realize the efficient process plan throughout the entire facility. When asked about working with the Derrick Building Solutions team, both Ruthie and Matt expressed the value of having the General Contractor as part of the team from the very beginning of the planning process. “Mark and others from Derrick provided valuable insights during the planning process,” Ruthie said. Once construction began it was clear that everyone from Derrick Building Solutions was invested in the project, “From the newest laborer to the owners of the company the entire team was courteous, helpful, and went the extra mile to make this project an exceptional experience. It was clear that they genuinely cared about our project,” Ruthie added. The precision parts manufactured by Croix Gear are used internationally in equipment ranging from commercial food mixers that are found in any bakery or pizza shop to fork lifts, scissor lifts, Harley-Davidson motorcycles, boats and sailboats, monster trucks, and a myriad of other equipment utilized in daily life. Croix Gear parts are used everywhere in all types of equipment. Croix Gear customers supply blueprints and design specifications and Croix Gear produces the precision parts, often starting with a 10-piece sample lot so clients can test their designs. Croix Gear is a precision manufacturer with the motto “To Be Exact,” and has systems in place to control product quality and repeatability. The company is ISO 9001:2015 Certified meaning they have a process for continual improvement in place including customer scorecard ratings of Croix Gear quality, and those surveys repeatedly show excellent performance by Croix Gear. In late 2018, Croix Gear employs 80 on two shifts and the company has a legacy of long-term relationships with customers, employees, and suppliers. This year they are celebrating their first 40-year employee and have several other dedicated team members who are nearing that landmark, as well, with 35+ years with the company. A shortage of skilled workers is something Ruthie Johnston and Matt Johnston are working to improve through efforts to bring awareness to the excellent opportunities for interesting and fulfilling work in manufacturing at all levels. They have been partnering with other area manufacturers, the Hudson Area Chamber of Commerce, the school district, the United Way, and others to create more opportunities for students of all ages to have positive exposure to manufacturing roles. Another philanthropic pursuit of Croix Gear includes manufacturing parts to support Life Pump, a non-profit organization providing mechanical well pumps for water wells throughout Africa and other areas of the world that are deprived of clean water and where electrical or fuel-powered pumps are not an option. Through Croix Gear’s efforts and partnering with the company that manufactures the gear box, and the generosity of additional donors Life Pump hopes to provide 10,000 mechanical pumps to less fortunate areas within five years. If you wish to become involved in the local manufacturing workforce initiatives or to participate in Life Pump’s mission, please contact Ruthie Johnston at the Croix Gear offices, 715-386-5144. To begin your own project contact Aaron Sundeen of Derrick Building Solutions at 715-243-0529.